The Danville Museum of Fine Arts and History is located in the Sutherlin Mansion on Millionaires' Row in Danville, Virginia. Built in 1859 for a leading citizen, Major William T. Sutherlin, the house has become well known as the temporary residence, April 3 - 10, 1865, of Confederate President Jefferson Davis. In this house, Davis authored his last official proclamation as president of the Confederacy. The government remained in Danville until receiving the news of Lee's surrender at Appomattox on April 10. Largely because of events documented in this house during the Confederacy's final week, Danville has become known as the "Last Capital of the Confederacy." At the time of its construction, the Sutherlins' home was considered the grandest in Danville. It was situated on four acres of land with several outbuildings: a kitchen, servants' quarters, a carriage house, greenhouse and stable. By 1912 the acreage had been reduced to approximately one and the outbuildings had been removed. 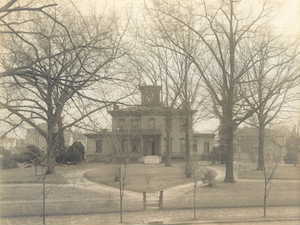 The house was used as the Danville Public Library from 1928 - 1972. The library added wings to the main building in 1934 and 1950. The site has been designated as a Virginia Historic Landmark and is listed on the National Register of Historic Places. The Danville Museum of Fine Arts and History offers a wide variety of exhibitions, classes, workshops, camps, and educational programs. The museum is a partner of the Virginia Museum of Fine Arts in Richmond and is a designated site of the Virginia Civil War Trails and Time Travelers programs.